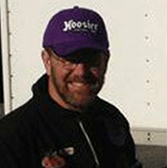 George has been involved with SCCA racing since 1990. He started playing in the Rally and Solo2 programs and quickly moved to Solo1 (now Time Trials) with a 1984 Red Devil F440 and began racing wheel to wheel in 2008. George was inducted into the SEDiv Time Trials Hall of Fame in 2007 and has served as the Divisional Administrator for the SEDiv Time Trials Program. George competed briefly in Improved Touring classes (ITC and ITA) but has always been drawn to the formula and sports racing categories. He spent several years in a motorcycle powered Formula Continental (prior to the advent of FB) and a D Sports Racer before “coming home” to F500 in 2010. The rumor of a 600cc 4 stroke option for F5 was the draw and he quickly converted his KBS Mk7 to Suzuki power and successfully ran the SARRC series in the SEDiv. With the sale of the KBS in the summer of 2012, he purchased the Rakavon – a unique NovaKar that Jay Novak built for his son, Brian, in 2006; the car that Brian won the RunOff’s with in 2007 – and converted it to motorcycle power. The 2013 season was a disappointment for George and the BuggBoyZ Racing Team. Receiving the F600 Challenge Series Hard Luck Award says it all! But with a little luck the last of the gremlins has been expelled and both the car and driver are ready for a clean start in 2014.